We are proud to live, work, and play in beautiful downtown Dunedin. It is the oldest city south of Cedar Key in Florida, founded in 1899 and named after Edinburgh, the capital of Scotland. This city and Caledonia Brewery have strong Scottish heritage and are proud of our roots. The city is home to the annual Dunedin Highland games and we are neighbors of the Scottish American society. We are also close to Florida Auto Exchange Stadium, the Spring training site for the Toronto Blue Jays as well as one of the worlds best beaches, Honeymoon Island. 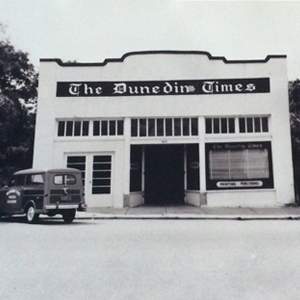 We are located on the gateway of historic Main Street and are housed in the old Dunedin Times Building, the original hometown newspaper that was built in 1925. The newspaper was printed here until 1965 and then became home to a popular local business Dunedin Printing. We are happily restoring the building to its original glory. Caledonia Brewing – Dunedin, FL | Powered by Mantra & WordPress.